The Queens Hotel is centrally located within the Lower Mainland with easy access to Vancouver, Richmond, Burnaby and Surrey. We are a quick 19 minute drive from the Vancouver International Airport (YVR) and close to several public transit options. Click here to download PDF of transit options including local buses and Skytrain stations. Click here to see a pdf of what is Good in the Hood . With several room types ranging from singles to family suites, we offer something for everyone whether your visit is for business or pleasure. At the Queens Hotel we are here to meet your needs, be it comfortable 13″ luxury beds or a strong Wifi signal in every room, you can expect the quality of service to match the ambience of our exceptional boutique property. Don’t miss out. Reserve your room now. Not to worry, pets are welcome. We have selected pet friendly rooms. Please read our pet policy. We offer airport drop off service for 4 people max to YVR airport ($25 gratuity to driver). For more information, please contact the Front Desk. Our staff speaks a variety of languages: Spanish, Mandarin, and Cantonese. Look What Our Guests are Saying! My partner and I love what the owners...Wally and his lovely daughter...Bonnie..have created in the heart of Queensborough Landing. Their resolve and dedication to revitalizing both the location and the community are inspirational! I had the honour of meeting their acquaintance and they are invested in their clientele and committed to providing five star service! Lovely staff, comfortable beds, access to gym and plaza fantastic! The hotel is an asset to the community. We highly recommend staying here! It’s a treasure! Area has changed so much. The room was clean and staff was extremely kind and helpful. Went to a wedding at Roma hall and instead of a cab home we stayed here and no regrets. Very affordable, clean hotel. The staff was very helpful and friendly. Great place to stay during our trip to Vancouver! Would definitely stay there in the future. Five Stars ***** !!!!! Great value, simple, clean and well maintained, friendly and helpful staff, bottled water provided, comfy bed and bedding even the double bed, free surface parking in private lot close to the door. Great for quick business trip stop overs. Super friendly staff ! Small historic boutique hotel. Located within walking distance to Queensbourough Landing outlets and Starlight Casino. Rooms can be tiny for a double room, l lot larger if you get a King. Some rooms have fridges, freezers and microwaves. Very clean. Steps away from a Liquor store, Convenience store, Nail salon & awesome pizza place. 3.5 stars ! When it comes to New Westminster Hotels, The Queens Historic Boutique Hotel is in a perfect location! Seated in the middle of a quiet residential neighborhood, the noise of the highway is blocked allowing you to get a full, peaceful nights sleep and wake to feel refreshed! And there is never a need to go far when there is so much close by. 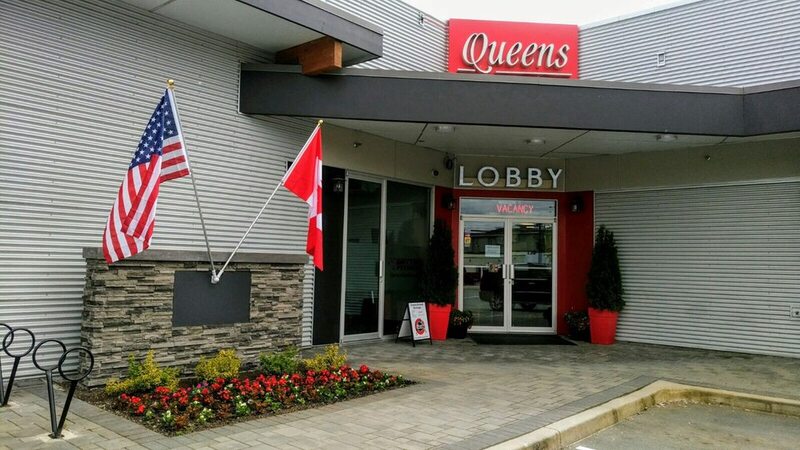 The Queens Hotel in New Westminster is only minutes away from a great variety of food options offering Chinese, American, Greek and Korean cuisine among others. Visit eateries such as Boston Pizza, Pho Express, Naan Bites, Opa Souvlaki, Nando’s Flame Grilled Chicken and Tora Sushi as well as classics like Starbucks, Tim Hortons Subway or A&W all within 15 mins walking distance or a less than 5-minute drive! The Queensborough Landing features many clothing shops such as a Banana Republic Factory Store, Bench Factory Store, Blue Notes, Garage, Gap Factory Store, Reebok, Payless Shoe Store, Tommy Hilfiger and more! If you need groceries or other staples look no farther than the Walmart Supercenter! With other final additions such as a Coast Capital Bank, Home Outfitters, Canada Post, Chatters Hair and Beauty and a Bell store this plaza has almost everything a person could want! The Queens Hotel is the closest Hotel in New Westminster to the Starlight Casino! Featuring a Match Eatery and Public House as well as a buffet and The Red Room Lounge, Starlight is great for a night of gambling or dinner and drinks with friends or family while you are in town and the best part? It’s less than a $10 cab ride to/from The Queens! Here in New Westminster The Queens Historic Boutique Hotel is proud to offer the best of New West but if exploration is what you desire than a short (less than 10min) bus ride will take you to 22nd street sky train station and from there you can easily travel all over Vancouver, New West, Burnaby and even to parts of Surrey and Richmond!